Boko Haram Says Video Shows Missing Nigerian Girls : The Two-Way The group that took more than 200 girls from a Nigerian school last month released what it says is a video of the girls, along with demands that the government release militants from prison. A still image taken from a video that the extremist group Boko Haram says is of more than 100 girls who were abducted from a Nigerian school last month. The group that took more than 200 girls from a Nigerian school last month released what it says is a video of the girls, along with demands that the government release militants from prison. The group's leader, Abubakar Shekau, says the video shows around 130 of the girls. In the undated video released Monday, a crowd of girls is seen outdoors, arranged as if for a class photo. They are wearing the full-length hijab; some portions of the footage show them praying. The video was first reported by Agence France-Presse; the agency says Shekau claims some of the girls "converted to Islam" as he talks on camera for 17 minutes. Several girls speak as well. "It is thought the majority of the abducted girls are Christians, although there are a number of Muslims among them," the BBC reports. "Correspondents said the girls appeared calm, and one said that they had not been harmed." 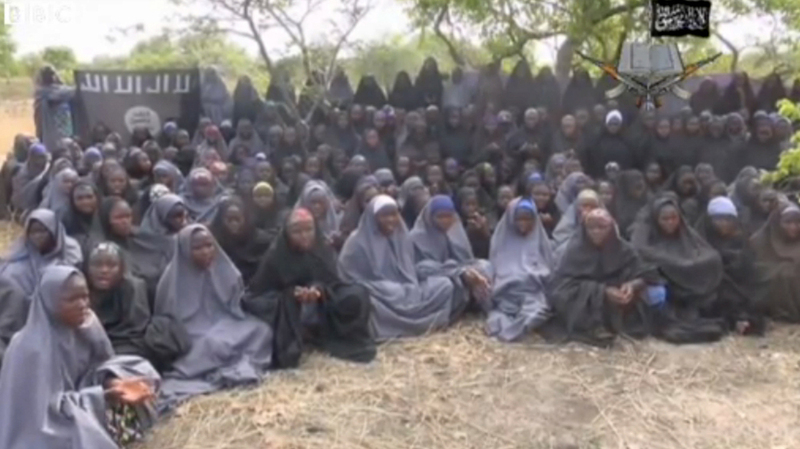 And CNN adds, "Shekau appears in a separate part of the video, but never with the girls." There's no way to be sure of the date the video was shot, but it offers some hope that the abducted girls have not been sold, as Boko Haram's leader has threatened. It also suggests that the girls, who were seized by gunmen during a raid in the northeast town of Chibok, haven't been dispersed, a move that experts say could make the girls harder to locate. Nigeria's Interior Minister Abba Moro tells the BBC that his government will not agree to an exchange of jailed militants for the kidnapped girls. "As far as this government is concerned, the option of [the] swap of innocent citizens with people who have taken arms against the country ... is not on the table," he said. Agence France-Presse has posted the video online again; the agency removed excerpts from the lengthy video earlier Monday.